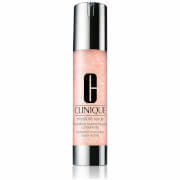 CLINIQUE moisture surge hydrating supercharge concentrate 48ml, a supercharged water-gel facial hydrator which instantly quenches dehydrated skin. Working instantly the concentrated moisturiser boosts skin's moisture reservoir for a full 24 hours. The unique, moisturising formula utilises Liquid-Sphere Technology, which works with water-binding ingredients and encapsulated antioxidant to break the cycle of dryness, whilst shielding the complexion from environmental aggressors. An ultralight water-gel for smooth, glowing skin. CLINIQUE moisture surge hydrating supercharge concentrate 48ml was found on 3 websites and was price compared using EAN: 0020714851125. The cheapest CLINIQUE moisture surge hydrating supercharge concentrate 48ml is shown as the main item, prices range from £21.10 to £36.00, excluding delivery. Price comparison based on price and delivery charges, with any valid discount codes being applied, is shown in the table above. Prices and information correct at the time of publication.